If you’re thinking about applying to the MFA in Photography program at Columbia College Chicago, then you betta like (photo)books! I didn’t really look at photo books or zines before I entered the MFA in Photography at Columbia. Once I started studying and researching, I still didn’t really look at them either. It wasn’t until the end of my fist year in the program that I started to become intrigued by the idea of the photo book as another tool to show my work. I’ve made a lot of work while here, and as I’m about to enter my final semester, the book form felt appropriate. At Columbia, you can take the Documentary Book class with Photography professor Paul D’Amato, paper-making, bookmaking, and so on. Paul and fellow Photography professor Kelli Connell own their own photo book publishing company called Skylark Editions, so you know that the professors love these books and take them very seriously. So, with the knowledge of my colleagues’ love for these objects and my growing interest in them myself, I made a rough edit maquette (or “sketch”) of a zine that I’m working towards getting published—heck, I’m even working on a book too. These two objects are a result of my interest in applying for the Albert P. Weisman Award here at Columbia College Chicago, a $2,000 grant that second semester first years MFAers and second-years can apply for (as well as junior and senior undergraduates.) This is a completion grant, and I really think it could help out my project and goals. I can’t personally produce these objects as it is very expensive to do so. I have a couple of images of the maquette zine that I’ve started. 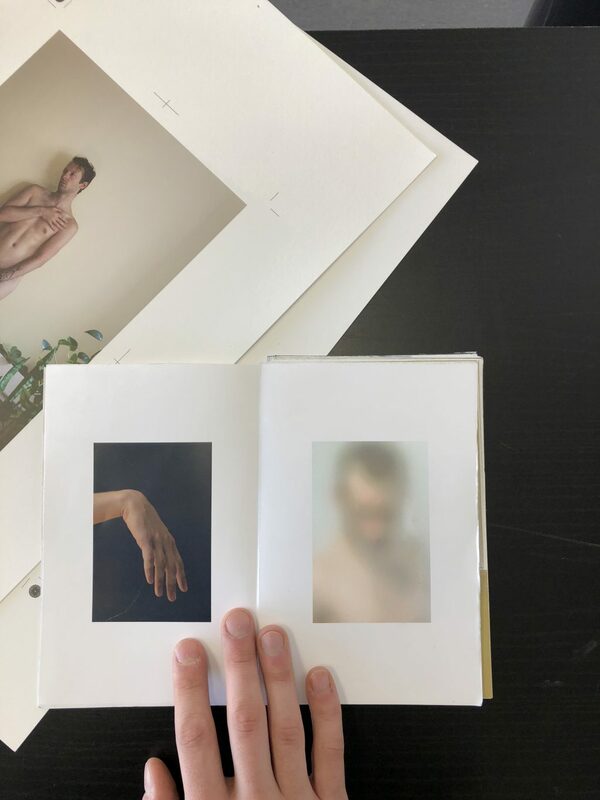 My plan for the work is to incorporate some polaroids and instant pictures that I’ve made earlier in my studies with the digital images that I’ve produced later, still implementing my relationship to talk about sexuality, gender identity and expression, all through the lens of historical and contemporary queer vernacular. 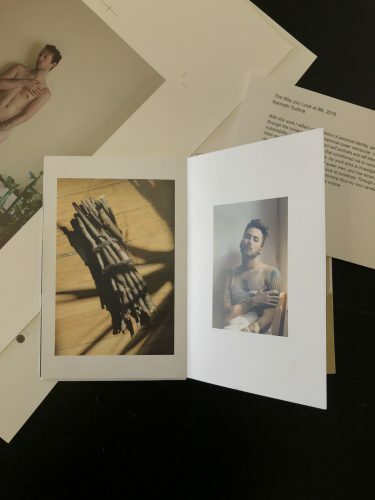 These projects, although using different formats of photography, are intergenerational and addresses my relationship to respective social and cultural positions as a queer man. when I started to put the pages together for this zine, at first I was super insecure and nervous. Then, I started showing it to my colleagues that approached me to look at it (saving it for critique as best as I can, but sometimes that just doesn’t work), and they really seemed to like it for a first edit. This made me feel a whole lot better, which is probably why I’m deciding to share it with all of you. My goal for the final zine is to have it smaller, 5.5 x 8.5″, with a black matte front and round corners. I’d like for the zine to reference the “little black book” trope, which refers to a written collection or list of sexual partners. Since this work is a long-term project that uses my partner (thus relationship) to make it work, I felt this to be appropriate. 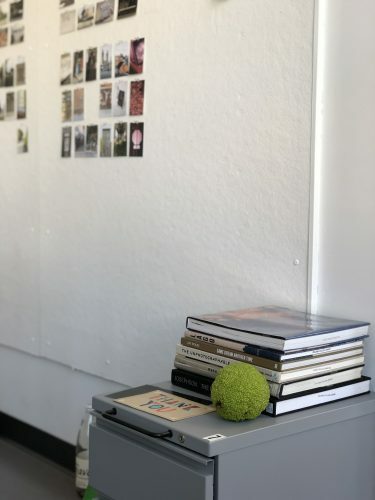 I definitely think that if you’re a student thinking about graduate studies in photography, where photo books are important to your research, you’ll get that experience here.